Chronic pancreatitis and disorders of the pancreatic ducts are often challenging to diagnose and manage, as their clinical manifestations are usually vague and serum analysis and routine imaging may often be noncontributory. Endoscopic retrograde cholangiopancreatography (ERCP) has long been considered the gold standard for evaluating the main pancreatic duct. The procedure offers potential interventions, such as stenting or fine needle aspiration, but is invasive and requires patient sedation. 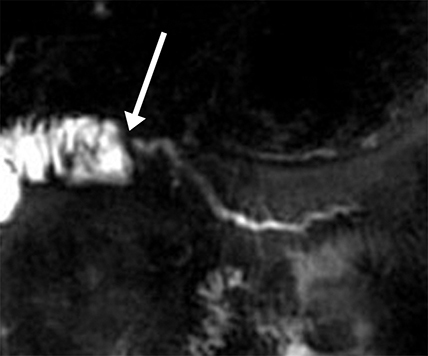 Magnetic resonance cholangiopancreatography (MRCP) represents a noninvasive imaging alternative for assessing the pancreaticobiliary ducts and is more sensitive than exocrine function tests at detecting mild chronic pancreatitis.1 Conventional MRCP’s ability to depict the entire pancreatic duct—particularly, the proximal aspect— however, can be limited, due to reduced filling of the duct with pancreatic secretions under normal conditions. As a result, areas where the duct is not well seen may be inadvertently diagnosed as narrowed or stenotic when in fact they are normal. 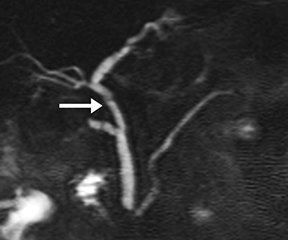 Duct-side branch visualization is also limited on MRCP. Finally, MRCP provides static images and does not assess exocrine function. 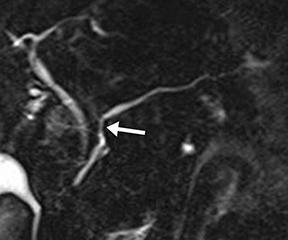 Secretin MRCP (s-MRCP), a dynamic MR pancreatography exam performed following secretin administration, can overcome many of these limitations by improving visualization of the pancreatic duct and increasing the diagnostic value of MRCP.2 s-MRCP studies originated at specialized academic institutions, but the protocol and secretin dosing are now commonplace and feasible for more widespread use. Newer 3D breath-hold sequences are also achieving higher resolution of the ducts and improving sensitivity.3 Herein we provide an overview of secretin and the s-MRCP technique, including a review of indications and examples of normal and abnormal findings on s-MRCP. Synthetic human secretin, manufactured under the brand name ChiRhoStim™, was approved by the FDA in 2004 for the stimulation of pancreatic secretions to help diagnose pancreatic exocrine dysfunction, stimulation of gastrin secretion to help diagnose gastrinoma, and facilitation of the identification of the ampulla during ERCP. In addition to the standard MRCP sequences, the s-MRCP protocol adds a series of single, thick-slab, heavily T2-weighted images covering the pancreatic duct and typically including the common bile duct, repeated every 30 seconds over 10 min, initiated at secretin administration. As with typical MRCP thick-slab sequences, saturation bands are often used to suppress signal from the renal collecting system and unrelated cystic lesions. Patients fast for 3-4 hrs prior to the examination. Oral contrast, consisting of a T2-shortening agent, is typically administered to suppress the signal from fluid in the duodenum on the T2-weighted sequences. At our institution, for example, oral contrast consists of a mixture of 1 cc of gadobutrol in 50-75 cc of water administered 30 min before the examination. The normal main pancreatic duct measures up to 3 mm in diameter. Following secretin administration, the normal duct usually dilates an additional 1-2 mm, with peak dilation at 3-5 min after injection (Figure 1).7 The duct should measure no more than 5 mm postsecretin, and no duct irregularity or side branches should be detected. At 10 min postinjection, the main pancreatic duct caliber should be near baseline, at or below 3 mm in diameter. Pancreatic secretions should also extend throughout the 2nd and 3rd segments of the duodenum, displacing the oral contrast and demonstrating high signal intensity on T2-weighted images. A mild increase in biliary secretion is occasionally seen with secretin administration (Figure 2). In older patients, the peak main pancreatic dilation may occur after 5 min postinjection due to periductal fibrosis. In patients who have had a prior sphincterotomy, the degree of dilation may be negligible, as the pancreatic secretions flow into the duodenum without ampullary resistance. s-MRCP increases the negative predictive value of a normal examination from 84% in conventional MRCP to 98% with secretin.8 For this reason, s-MRCP is often used as a screening tool instead of ERCP. 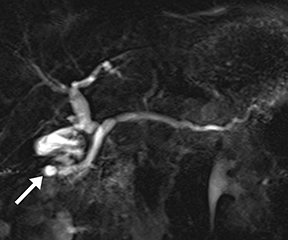 Morphological features of chronic pancreatitis on s-MRCP include an irregular, dilated main pancreatic duct and dilated side branches.9 These parallel the findings in ERCP, which has been used to stratify the severity of disease under the Cambridge Classification.10 There is currently no MRI-specific grading system for chronic pancreatitis. Isolated dilated side branches are typically seen in mild chronic pancreatitis. 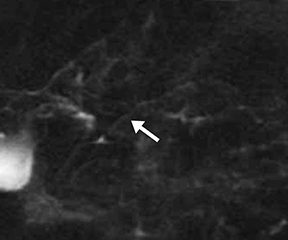 s-MRCP increases the sensitivity for the detection of early disease by promoting the filling of dilated side branches which may not be apparent on conventional MRCP (Figure 3). As severity of chronic pancreatitis increases, duct compliance falls, resulting in decreased secretin-induced dilation, typically coinciding with worsening duct irregularity and overall chronic dilation (Figure 4). Acinar filling in s-MRCP is a pattern of pancreatic parenchymal enhancement (Figure 5) which, if seen alone, is specific but insensitive for early chronic pancreatitis.13 This is not to be confused with acinar filling on ERCP, which results from excessive pressure from contrast injection and is associated with ERCP-induced pancreatitis. Pancreatic duct stenosis can result from prior pancreatitis, or it can be iatrogenic; in severe cases, the condition may require stenting or diversion. 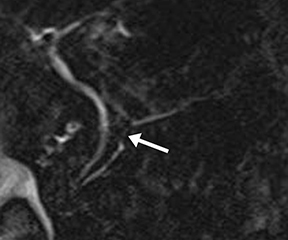 While conventional MRCP can detect secondary effects of pancreatic duct stenosis, such as upstream dilation, if the remainder of the duct is normal in caliber, the stenosis may not be real, as the normal duct may simply be compliant and collapsed during a state of pancreatic inactivity. 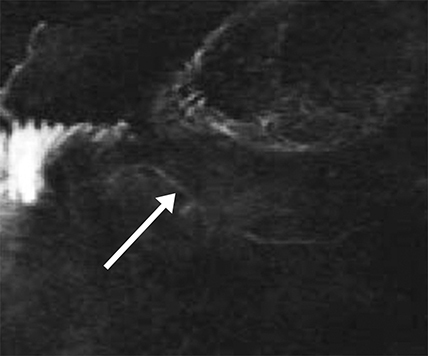 Transient increased ductal pressure from secretin can help distinguish between these pseudostrictures versus areas of true luminal narrowing on s-MRCP (Figure 6). A disrupted pancreatic duct is usually a complication of acute pancreatitis or trauma, and it can lead to substantial morbidity if not detected early. 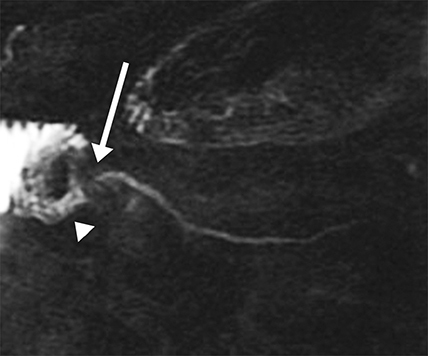 The main pancreatic duct is typically normal in caliber in acute pancreatitis; however, extensive edema and ascites may mask the duct on MRCP and complicate detection of pancreatic duct disruption. 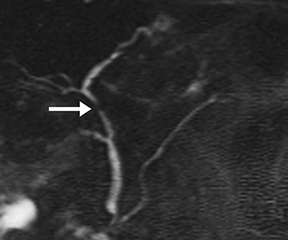 Secretin distends the duct so it can be better visualized on s-MRCP, and areas of duct nonvisualization can suggest regions of duct disruption. Secretin-induced secretions can also highlight an active leak (Figure 7).14 s-MRCP can also be used to evaluate the pancreatic duct poststenting or after distal pancreatectomy to detect persistent leaks. Ductal anomalies arise from variations in the fusion of the ventral and dorsal pancreatic buds during embryological development and are usually clinically insignificant. Certain configurations, such as pancreas divisum, increase the likelihood of developing pancreatitis.15 Other conditions, such as pancreaticobiliary maljunction, result in abnormal reflux of both pancreatic and biliary secretions, increasing the risk for both cholangiocarcinoma and pancreatitis. Such anomalies can be suspected in patients who have had frequent mild episodes of pancreatitis with no clear etiology or risk factors. 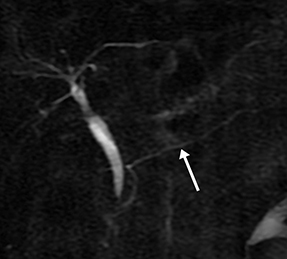 Ductal dilation during s-MRCP increases sensitivity to these anomalies.16 Secondary signs of chronic obstruction, such as a Santorinicele in patients with pancreas divisum, are occasionally appreciated only with the additional ductal pressure following secretin stimulation (Figure 8). 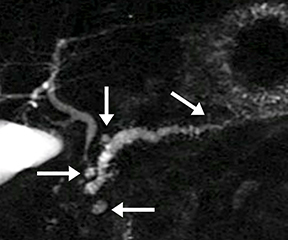 s-MRCP is the optimal and sometimes only option for evaluating pancreatic ductal anatomy in patients with bowel diversions that preclude ERCP, including a roux-en-Y gastric bypass and a Whipple procedure.17 Such examinations are used to assess a wide variety of pathology including chronic pancreatitis and anastamotic or ductal strictures (Figure 9). Autoimmune pancreatitis (AIP) is a rare entity with a wide spectrum of clinical presentations, sometimes overlapping with typical pancreatitis; at other times presenting as painless jaundice. While the most common form of AIP, type I, is associated with a spectrum of IgG4-related disease with potential multi-organ involvement, type II AIP is often isolated to the pancreas, has no correlating serum markers and 0is pathologically distinct.18 Segmental AIP, seen in either type, can mimic an adenocarcinoma on CT or MRI. s-MRCP has rarely been used in assessing AIP, but it may help differentiate focal AIP from tumor by improving visualization of the duct through the affected region.19 This sign, known as “duct penetration,” favors AIP over a ductal adenocarcinoma, which typically obliterates the duct. s-MRCP is uniquely suited to evaluate a wide variety of pancreatic pathology noninvasively, serving as an effective screening tool in place of ERCP. 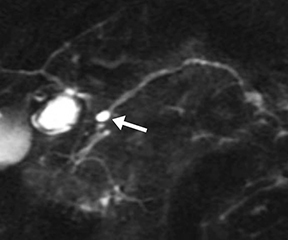 While s-MRCP requires more time to perform than conventional MRCP, its additional diagnostic capabilities over MRCP have spurred the wider adoption of this technique at nonspecialized centers. Alkaade S, Cem Balci N, Momtahen AJ, et al. Normal pancreatic exocrine function does not exclude MRI/MRCP chronic pancreatitis findings. J Clin Gastroenterol. 2008; 42(8):950-955. Tirkes T, Sandrasegaran K, Sanyal R, et al. 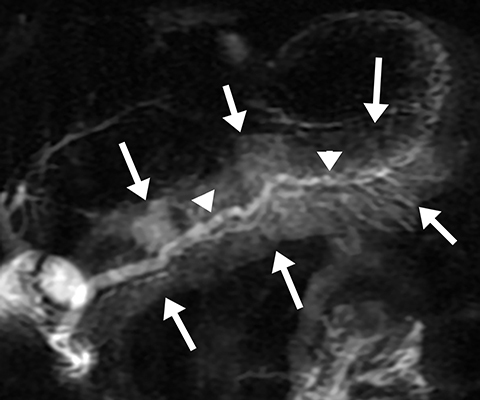 Secretin-enhanced MR cholangiopancreatography: spectrum of findings. Radiographics. 2013; 33(7):1889-1906. Tirkes T, Menias CO, Sandrasegaran K. MR imaging techniques for pancreas. Radiol Clin North Am. 2012; 50(3):379-393. Pandol SJ. The exocrine pancreas. San Rafael,CA: Morgan & Claypool; 2011. Boyer JL. Bile formation and secretion. Comprehensive Physiology. 2013; 3(3):1035-1078. Mensel B, Messner P, Mayerle J, et al. Secretin-stimulated MRCP in volunteers: assessment of safety, duct visualization, and pancreatic exocrine function. AJR Am J Roentgenol. 2014; 202(1):102-108. Fukukura Y, Fujiyoshi F, Sasaki M, et al. Pancreatic duct: Morphologic evaluation with MR cholangiopancreatography after secretin stimulation. Radiology. 2002; 222(3):674-680. Hellerhoff KJ, Helmberger H 3rd, Rosch T, et al. 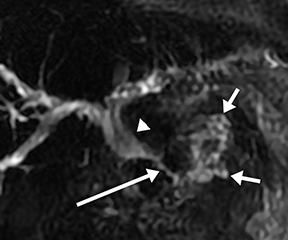 Dynamic MR pancreatography after secretin administration: Image quality and diagnostic accuracy. AJR Am J Roentgenol. 2002; 179(1):121-129. 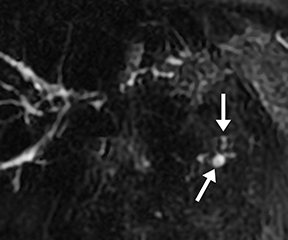 Czako L. Diagnosis of early-stage chronic pancreatitis by secretin-enhanced magnetic resonance cholangiopancreatography. J Gastroenterol. 2007; 42 Suppl 17:113-117. Sarner M, Cotton PB. Classification of pancreatitis. Gut. 1984; 25(7):756-759. Sanyal R, Stevens T, Novak E, et al. Secretin-enhanced MRCP: Review of technique and application with proposal for quantification of exocrine function. AJR Am J Roentgenol. 2012; 198(1):124-132. Schneider AR, Hammerstingl R, Heller M, et al. Does secretin-stimulated MRCP predict exocrine pancreatic insufficiency? A comparison with noninvasive exocrine pancreatic function tests. J Clin Gastroenterol. 2006; 40(9):851-855. Matos C, Deviere J, Cremer M, et al. 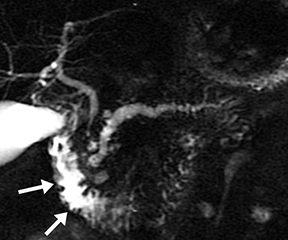 Acinar filling during secretin-stimulated MR pancreatography. AJR Am J Roentgenol. 1998; 171(1):165-169. Gillams AR, Kurzawinski T, Lees WR. Diagnosis of duct disruption and assessment of pancreatic leak with dynamic secretin-stimulated MR cholangiopancreatography. AJR Am J Roentgenol. 2006; 186(2):499-506. Wang DB, Yu J, Fulcher AS, et al. 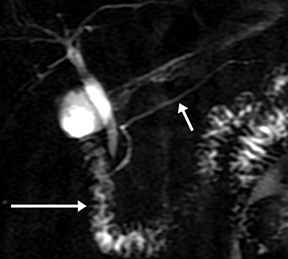 Pancreatitis in patients with pancreas divisum: imaging features at MRI and MRCP. World J Gastroenterol. 2013; 19(30):4907-4916. Rustagi T, Njei B. Magnetic resonance cholangiopancreatography in the diagnosis of pancreas divisum: A systematic review and meta-analysis. Pancreas. 2014. Monill J, Pernas J, Clavero J, et al. Pancreatic duct after pancreatoduodenectomy: Morphologic and functional evaluation with secretin-stimulated MR pancreatography. AJR Am J Roentgenol. 2004; 183(5):1267-1274. Sidi AA, Cameron JS, Dykstra DD, et al. Vasoactive intracavernous pharmacotherapy for the treatment of erectile impotence in men with spinal cord injury. J Urol. 1987; 138(3):539-542. Carbognin G, Girardi V, Biasiutti C, et al. 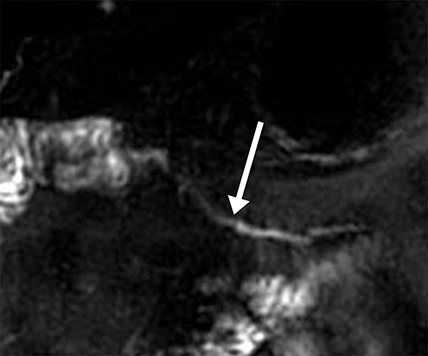 Autoimmune pancreatitis: Imaging findings on contrast-enhanced MR, MRCP and dynamic secretin-enhanced MRCP. Radiol Med. 2009; 114(8):1214-31. 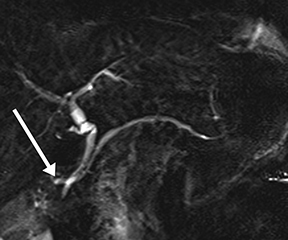 Dynamic pancreatography with secretin-MRCP. Appl Radiol. Dr. Tsai and Dr. Lee are with the Department of Radiology, Beth Israel Deaconess Medical Center, Boston, MA.